In 2013 James McBride won the prestigious National Book Award for his novel The Good Lord Bird, which follows a teenage slave who joins abolitionist John Brown’s 1859 rebellion. Prior to that, McBride had authored the best-selling memoir The Color of Water and two works of fiction: Song Yet Sung and Miracle at St. Anna. Currently, McBride serves as a Distinguished Writer in Residence at the Arthur L. Carter Journalism Institute at New York University. A talented saxophonist and composer, McBride continues to write and perform music while also teaching music to children living in the Brooklyn, N.Y., housing projects where he grew up. 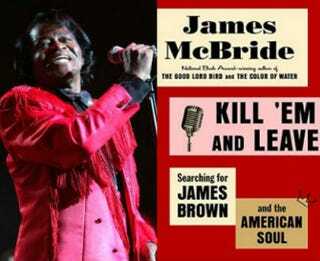 Now McBride combines these three interests—writing, music and education—and gifts us with a new biography of legendary musician James Brown: Kill ’Em and Leave: Searching for James Brown and the American Soul. James Brown, of course, needs no introduction. The legendary musician recorded 321 albums—of which 16 were hits and 45 of them went gold. While alive, James Brown sold more than 200 million records. The first musician to record a “live” album that made it to No. 1, Brown fused all forms of music—jazz, funk, rock, classical, country and the blues. His funeral in 2006 was legend; thousands of people flocked to the streets to mourn, including Michael Jackson, who flew to Augusta, Ga., for the service. James Brown left behind a fortune worth over $100 million, most of it willed to charity in service of poor children. “For African Americans, the song of our life, the song of our entire history, is embodied in the life and times of James Brown,” writes McBride. In writing this biography, McBride’s task is threefold: to get to the heart of the real James Brown, highlight Brown’s importance for a new generation who may be ignorant of the vital role Brown played in American music, and to debunk the caricatures and misrepresentations of Brown portrayed in mainstream media, such as the 2014 film Get on Up, filtered through the white gaze of the director of The Help to become “yet another white version of black history.” That film, McBride tells us, not only mischaracterizes Brown’s mother as a drunken whore (she was not) and his father as a wife-beating angry black man (he was not) and Brown himself as a potty-mouthed, violent and unaware man (he was not), but also relies on stereotypes such as the “good loyal white man as manager” and the big, loud, sassy black woman. James Brown, McBride believes, deserves more. He deserves better. He deserves to have the story of his life told in a way that is closer to the truth than to made-up fiction. On the trail of James Brown, McBride travels from Augusta, Ga., to Barnwell County in South Carolina and a multitude of other places. He becomes a regular at a soul food restaurant in Barnwell County, seeking out Brown. But the locals there are fiercely protective of the man and his legacy. Instead, what McBride is witness to are the layers of history in each interaction between blacks and whites in the South—a kind of low “buzz” of historical tension that permeates everything. “It’s nothing said, or even seen, for black folks in South Carolina are experts at showing a mask to the white man,” writes McBride. “The smile goes out before their faces like a radiator grill” in order to “avoid the white man’s evil.” They are the descendants of slaves here, McBride tells us. They have learned this lesson well throughout the past generations. For Kill ’Em and Leave is not just a biography of James Brown. It is an exploration of the meaning of soul music for black folks and American culture as a whole; it is an exploration of music, race and culture in America. It is an exploration of the place of black music in black life: the music’s ability to sustain black hope, black dreams and black strength through decades of white supremacist violence in the South—through the ongoing pressures of everyday racism in our modern era. McBride’s vivid, visceral prose carries the narrative rapidly along, deftly sidestepping the pitfalls that oftentimes make the biography genre staid and uninteresting. Instead, McBride’s narrative overflows with energy and excitement, bringing people and places to life. But he does not sacrifice journalistic integrity for entertainment; McBride’s in-depth reporting and respectful treatment of Brown and those who knew Brown craft an honest, powerful portrayal of the life and times of James Brown—as well as the ongoing impact of his legacy. Here is a timely reflection of the power of black musicians to shape us, to free us; the soundtrack that bears witness to our most intimate moments of sorrow, triumph and bliss.